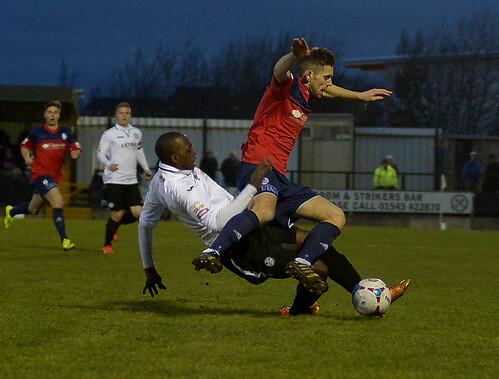 In a game that swung from one way to the other the honours were eventually shared as a superb advert for non-league festive football ended with AFC Telford United cancelling out a rousing Hednesford Town second half comeback. History suggested that Keys Park regularly plays host to a dramatic Boxing Day fixture and this one was no different as vociferous support from both teams created a tinderbox atmosphere inside the ground. 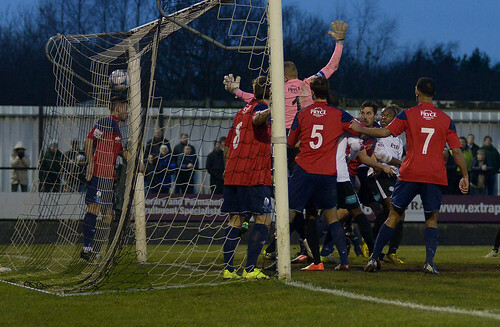 The whole match was played at a frenetic pace and it was Hednesford, faster out of the blocks, who opened the scoring when Elliott Durrell’s free kick was diverted unchallenged into his own goal by Neil Byrne on 17 minutes. 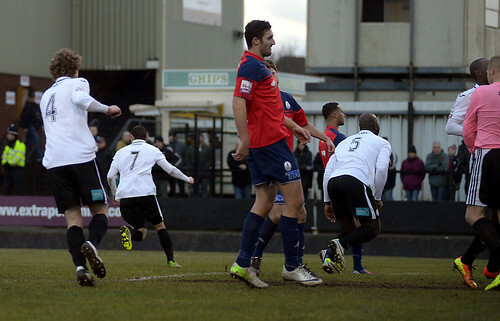 Despite finding themselves a goal down, the away side still carried an attacking threat with Pitmen keeper Dan Crane needing to command his area from a flurry of crosses and balls into the box. The home side, vocally supported by their fans in the Heath Hayes End, looked to have made it to half time ahead but Telford superbly lit up the proceedings with a goal of real class. Adam Farrell superbly took a ball down the flank in his stride and volleyed a perfect cross, under pressure from Darren Campion, to the feet of Mike Grogan who volleyed sweetly into the far top corner to equalise. Telford came out for the second half suitably fired up and within four minutes were ahead when a deep corner was expertly headed back over Crane by Grogan to send the travelling contingent wild. 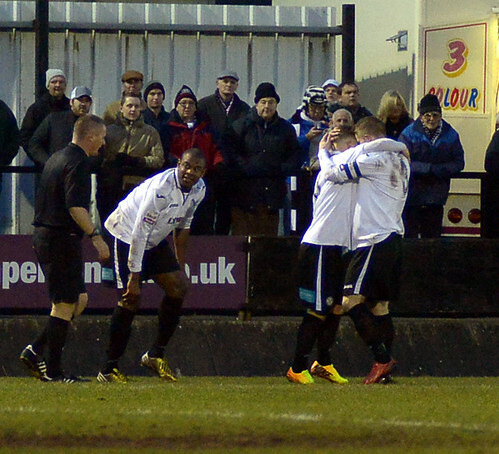 Andy Owens missed a glorious opportunity shortly afterwards to double Telford’s advantage before Keys Park erupted twice in the space of three minutes as The Pitmen sensationally equalised and then took the lead. Cult hero Marvin Robinson, re-signed on Christmas Eve, returned with a timely present for the Hednesford supporters as he rose highest at the back post to level the scores from a Durrell corner on 56 minutes and then Paul McCone made it 3-2 on 59 minutes, getting the slightest touch to a Durrell free kick as pandemonium broke out on the terraces. 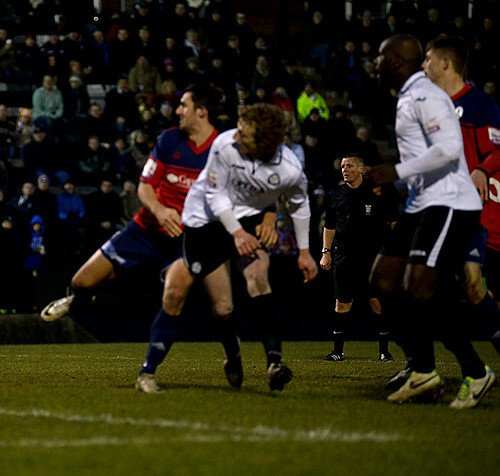 Rob Smith looked to defend the home side’s one goal lead by bringing on defender Ben Bailey for striker Neil Harvey but Telford, desperately pushing forward for an equaliser, forced the ball into the net as substitute Mike Phenix bundled in from a Matty McGinn corner on 78 minutes. 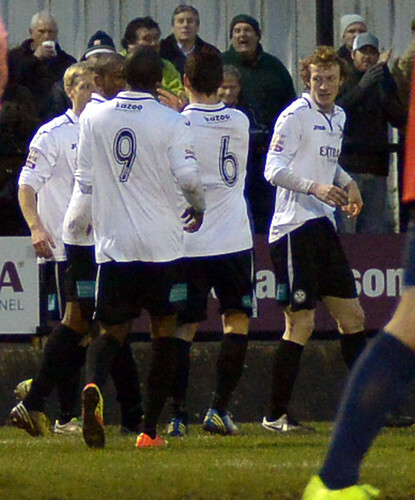 Neither side were able to create a chance to score an elusive winner but, with Brackley drawing and Solihull Moors conceding a late equaliser at Worcester City, The Pitmen go into Saturday’s round of fixtures still top of the Skrill North after a dramatic, pulse-quickening local derby full of action and endeavour.